This is a custom made biltong drying box comes plain or with a personalised name on the front of your choice. The boxes come in natural pine, teak effect, white wash or oak effect. The box works with a 100w infra-red heat element and 2 small fans. With the two together it creates a constant warm air flow for drying. 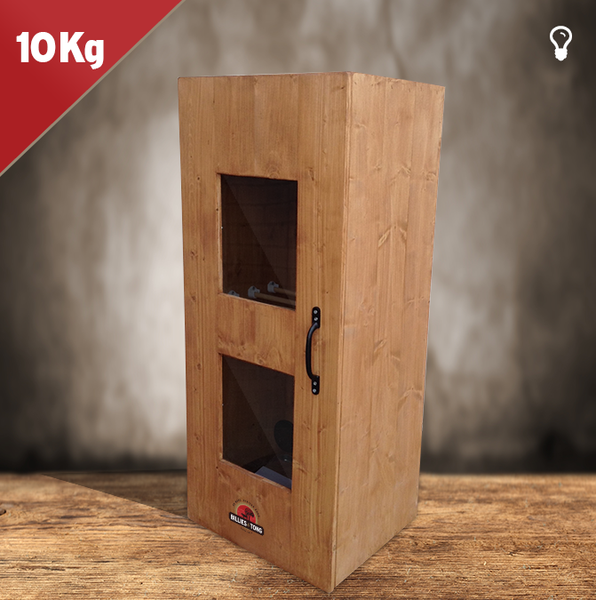 This box can hold up to 10kgs of meat at one time. Drying time is 3 to 4 days depending on your and your own preference. 30 x stainless steel or plastic hooks. If you require any customisation please select ‘Yes’ above and leave a note on checkout with your wording.